Brother of self-exiled Islamic cleric Fethullah Gulen, whom Ankara suspects of organizing the July 15 coup attempt, was detained in Gaziemir district of Turkey’s western province on charges of being member of Fethullah Gulen Terrorist Organization (FETO), according to local media. 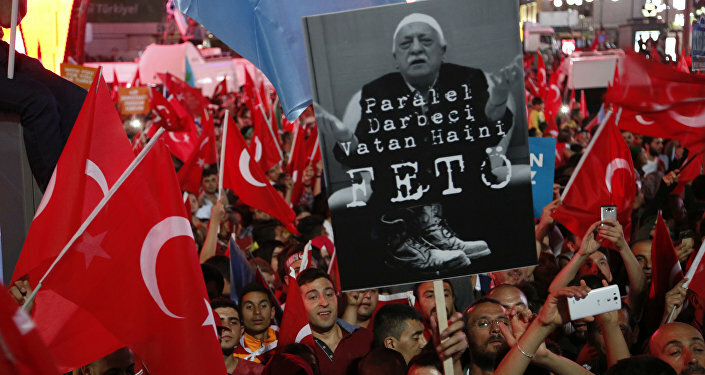 ANKARA (Sputnik) — Turkish police detained brother of self-exiled Islamic cleric Fethullah Gulen, whom Ankara suspects of organizing the July 15 coup attempt, in the province of Izmir on terror charges, local media reported Sunday. Kutbettin Gulen was detained in Gaziemir district of Turkey’s western province on charges of being member of Fethullah Gulen Terrorist Organization (FETO), according to Anadolu news agency. On July 15, an attempted coup took place in Turkey, but was suppressed the following day. Over 40,000 people have been detained since the attempted overthrow of the Turkish government that led to over 260 deaths. On Wednesday, Turkish Justice Minister Bekir Bozdag said up to 70,000 people had been investigated in the country for links to self-exiled Islamic cleric Fetullah Gulen and the so-called Fethullahist Terrorist Organization/Parallel State Structure (FETO) suspected of masterminding the attempted overthrow.